Converters, coachbuilders and operators will recognise the New Daily as, on the outside at least, it’s visually a very similar vehicle. The latest changes are an upgrade rather than a complete new model as the body structure including the bonnet, is the same as the previous model launched on the top of Mont Blanc in 2016. But beneath the skin – and parts of the skin – much has been improved. There are new elements based on operator feedback including a new grille and intermediate front panel as well as new bumpers and new 15% brighter LED headlights designed to last the life of the vehicle. Following research that revealed only 10% of frontal accident damage requires a complete new unit; the composite front bumper is now in three sections that can be purchased separately. It also protrudes 40mm further forward and 25mm further to the sides to increase protection for the painted metal elements of the structure. Attractive alloy wheels are an option on certain models. Inside the cab, the new, smaller diameter, leather-trimmed steering wheel incorporates 20 integrated switches. It is elliptical with a flattened-off lower part to give more room for larger drivers to access the cab. Additional adjustments can now be made to the steering column to make finding a comfortable driving position easier. A new feature is ‘City Mode’ activated by a button on the dash, which reduces the amount of effort required to steer by 70%. Also said to aid movement around the cab is the replacement of the traditional handbrake with an electric parking brake. Incredibly, they claim that on parcel delivery work this will save up five man-hours a month. 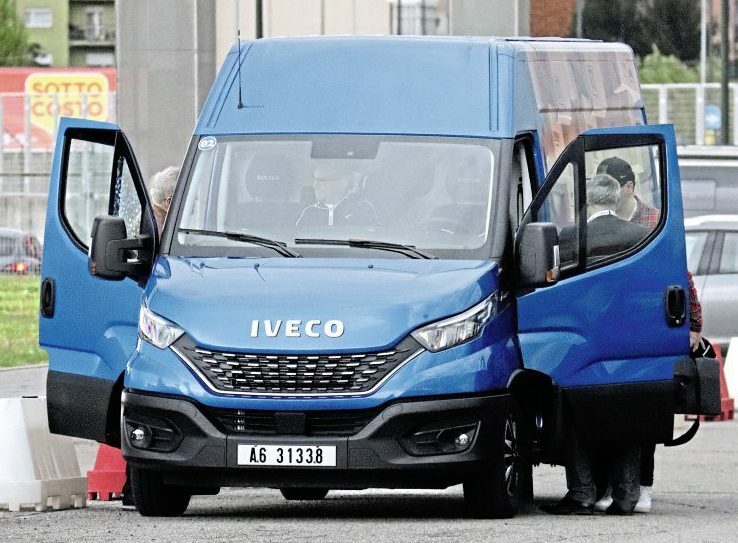 When supplying chassis cowls, Iveco does offer its own electric door option to coachbuilders and this can optionally be synchronised with the electric parking brake. A tyre pressure monitoring system is another option. In the centre of the dash console there is a seven-inch display screen used to display the many connectivity related functions as well as the reverse camera display. 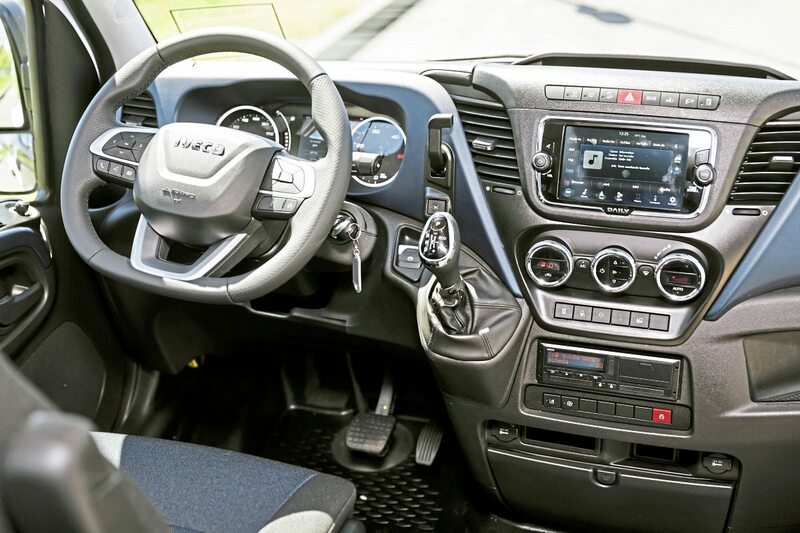 Drivers can integrate their phones with the Hi-Connect infotainment system with voice recognition. It accepts Apple Car Play and Android Auto and also incorporates a rear camera, DAB radio and a Tom Tom car/truck navigation system. The main reason behind the timing of this upgrade is the requirement to satisfy the latest EuroVID emission control requirements. In doing so, Iveco has achieved quite a number of advances for customers, especially those operating minibuses, with the introduction of a Heavy Duty version of the F1C three-litre engine delivering 210hp rather than the previous maximum of 180hp, a significant upgrade achieved through a switch from pneumatically controlled turbochargers to entirely electronic ones. They give faster transient response times, better performance and increased economy. 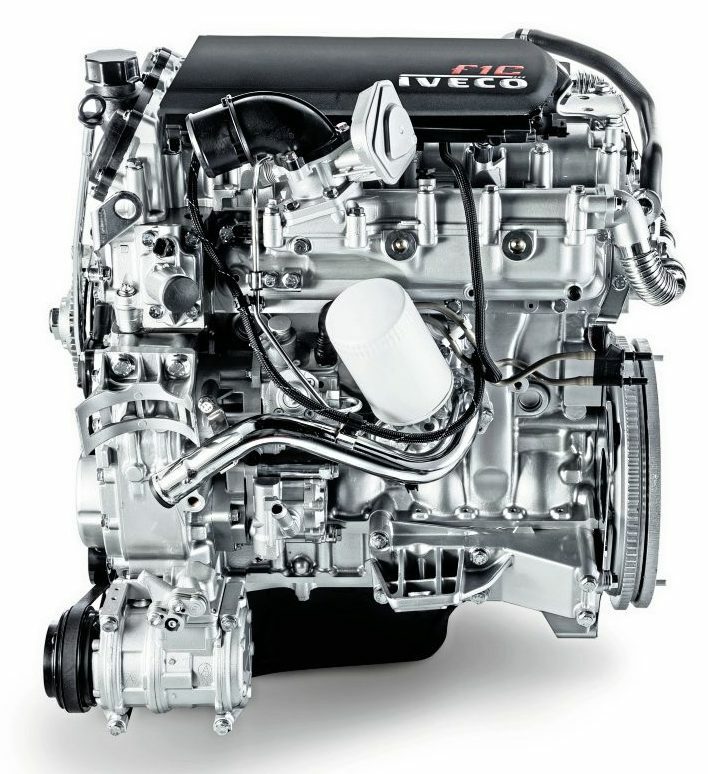 As before, Iveco continues to offer two diesel engine families. 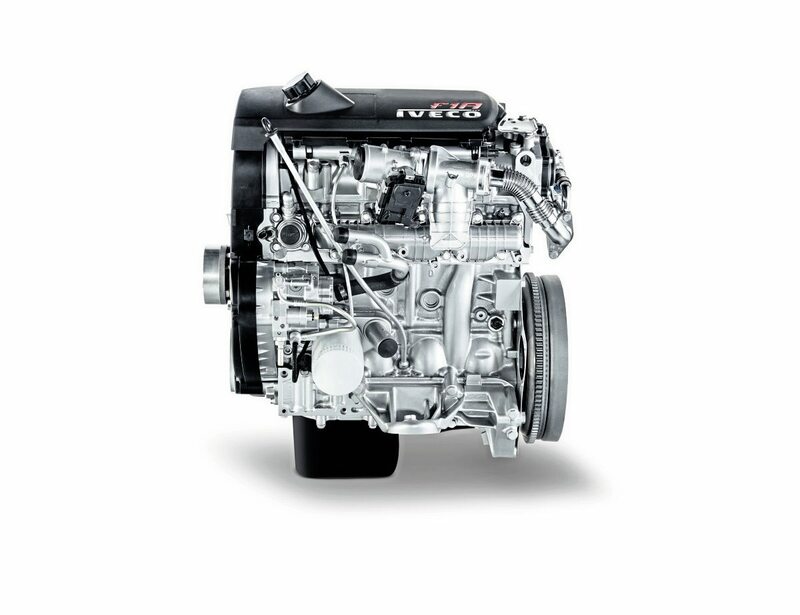 The 2.3-litre F1A has Euro6D light duty (116hp/136hp/156hp) and EuroVID heavy duty (140hp/160hp) options while the 3.0-litre F1C offers Euro VID heavy duty ratings of 160hp, 180hp and 210hp. Both benefit from a larger oil sump, up from 5.2 litres to 7.5 litres, which has enabled F1A oil change intervals to go up from 50,000 to 60,000km using the same oils, while the F1C is up from 40,000 to 50,000km. Gearbox options are the popular, ZF-based Hi-Matic eight-speed automatic or a six-speed manual unit. Options differ but with the heavy duty three-litre unit you can either box with the 180hp option, the manual only with the 160hp and the Hi-Matic only with the 210hp and the Natural Power CNG alternative, of which more later. 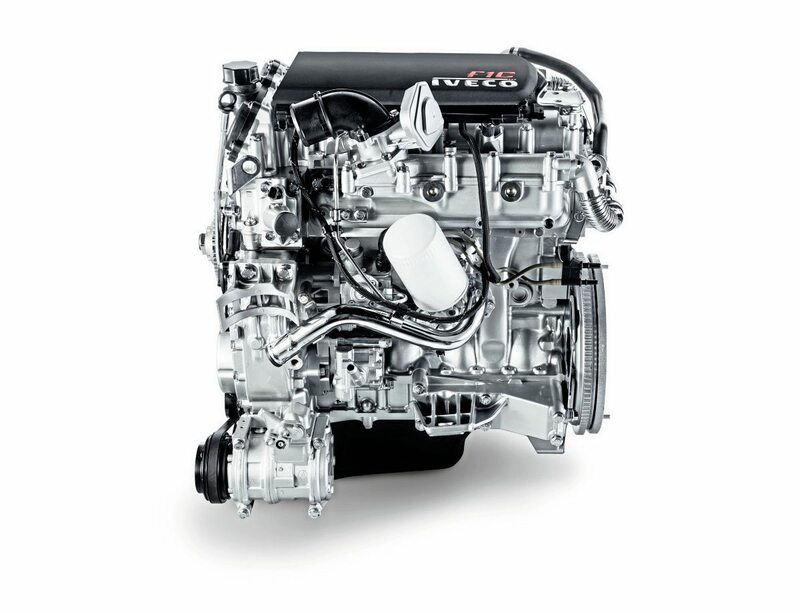 A boost to fuel economy comes from the introduction of stop/start technology on automatics, switching off the engine when stationary, but only on the 2.3-litre F1A, as the gain was not considered worth the investment on the larger output unit. Fuel economy improvements are very work-dependent but I was given a figure of between 2-8% with a new range of very low rolling resistance tyres, developed in conjunction with Michelin but only available through Iveco, also help. For diesels, the next changes will be at the end of 2021 when EuroVIE comes in. This will be in September for heavy-duty applications and December for light duty. On the smaller F1A engine, a new electronically controlled variable geometry turbocharger is employed which is both more efficient and more responsive during the warm up phase. The F1C retains a VGT (Variable Geometry Turbocharger). Another upgrade is the new 220A 12-Volt alternator. Alternative fuel options include both electric (at a maximum of 5 tonnes GVW) and gas. The gas model, denoted with the letters NP (Natural Power), is heavy duty EuroVID development of the F1C rated at 136hp/101kW. There is also a CNG alternative that has an additional diesel engine, but this is not a true dual-mode vehicle because the diesel is down-rated to give reduced performance and is only intended to get you to a CNG refuelling point. With full tanks the NP Daily weighs around 300kg more than an equivalent diesel. The electric option uses sodium rather than lithium based batteries and has a somewhat limited range at 120-150km. Slow charging can take 12 hours though fast charging can be accomplished in 30 minutes if you have a sufficiently powerful charger. Though available in right hand drive in the UK, no electric Daily minibuses have yet been sold. The finish of the grille can give you an idea of what is beneath the bonnet. Gas and electric version have the tips of the grille elements finished in blue, Hi-Matic gearbox vehicles have silver grilles and the others are black. Developments to Daily’s range of driver assistance systems are standard on Hi-Drive vehicles and optional on others (unless legally required). 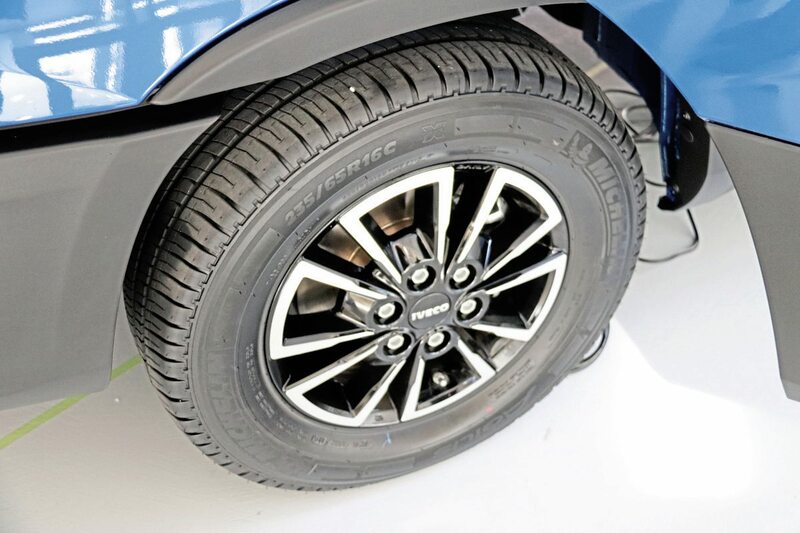 The advanced emergency braking system will activate braking and ensure that there is no collision at speed of up to 50km/h, while the City Brake Pro system will ensure there is no collision at speeds as low as 5km/h. For heavy traffic, Queue Assist can be activated to safely follow the car in front without hitting it. Iveco claims this is the first 7.2 tonne application for both Queue Assist and City Brake Pro. Further features are ProActive Lane Keeping Assist and Crosswind Assist, which come in to assist the driver when required. In what the manufacturer believes is a first for rear-wheel-drive vehicles in the Daily’s class, it has launched Hill Descent Control (HDC) and Traction Plus. HDC, if selected, enables the driver to maintain a safe, steady speed when descending steep slopes, while Traction Plus is another push button function which, when pulling away on slippery surfaces, transfers the torque to the wheel with the most grip. It works at up to 30kph. 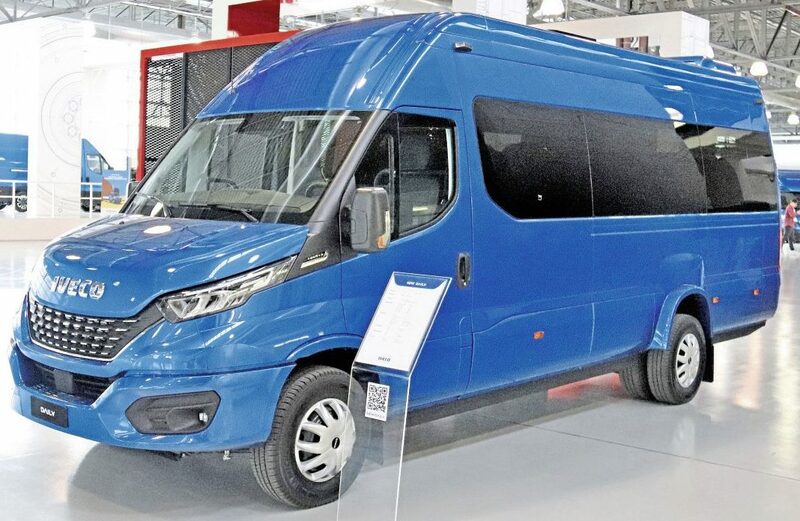 Tourys Plus is the top model in the complete Iveco minibus offering, with a maximum capacity of 19 coach seats as well as air conditioning, a power plug door and 2.5cubic metre drop boot. It is possible to get 22 seats in a more basically specified Daily Line based model without the boot but, for a high specification, 19 is the limit. Significantly, features such as wheelchair lifts can be added without restricting passenger capacity because of the Daily’s relatively high GVW. UK customers can purchase nearly all versions of the Daily including the CNG fuelled ‘Natural Power’, the electric (though nobody has yet done so) and the diesels. The one exception is the version of the CNG Daily that includes a diesel capability to get you to a CNG fuelling station. This omission is purely because there is nowhere to put the necessary equipment on a right hand drive bus. Incidentally, UK destined CNG buses have the fuelling point on the right-hand side while continental operators get it on the left. 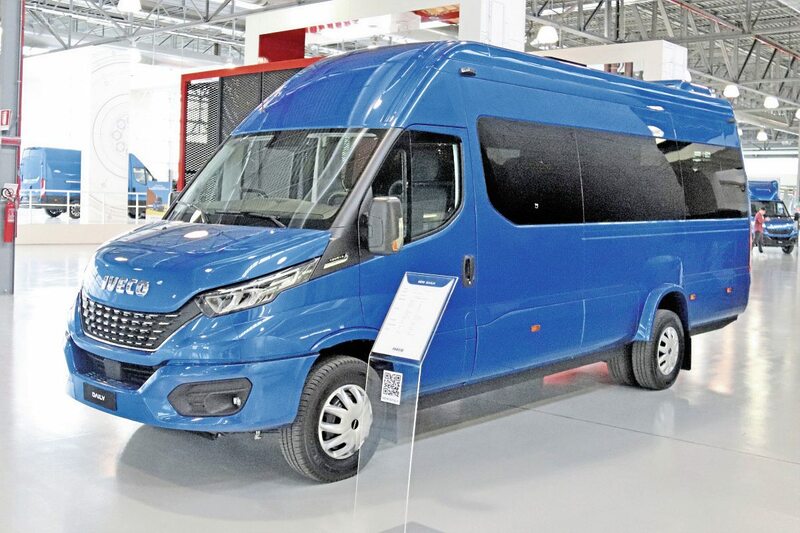 Availability will be phased but all models should be in the market by the summer, with minibuses towards the start of the programme (around May) and the 210hp engine towards the end. 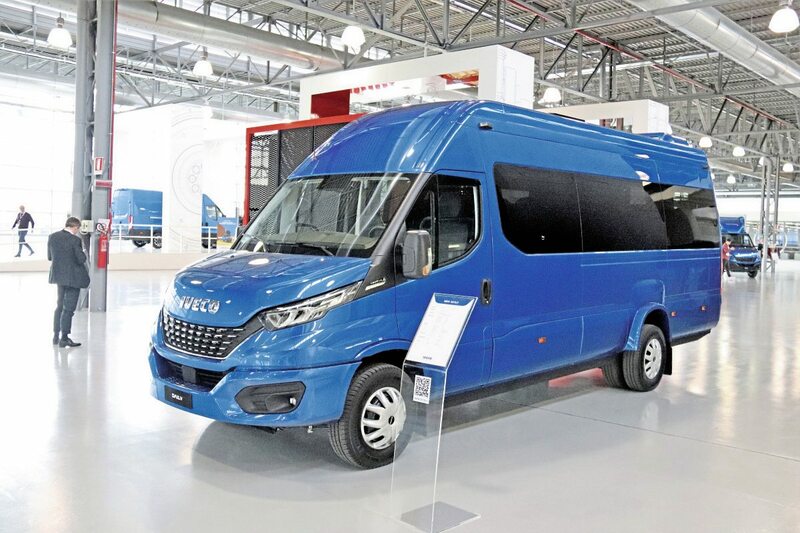 Iveco’s recognised bodybuilder arrangements will continue including Noones on both 6.5-tonne and 7.2-tonne chassis, Mellor which offers offer the Maxima on a 70C chassis cab, Nutrak and Courtside who convert the 70C van. The European plants produced a total of 92,000 Daily products last year, as well as a further 5,000 in Brazil and 40,000 in China. 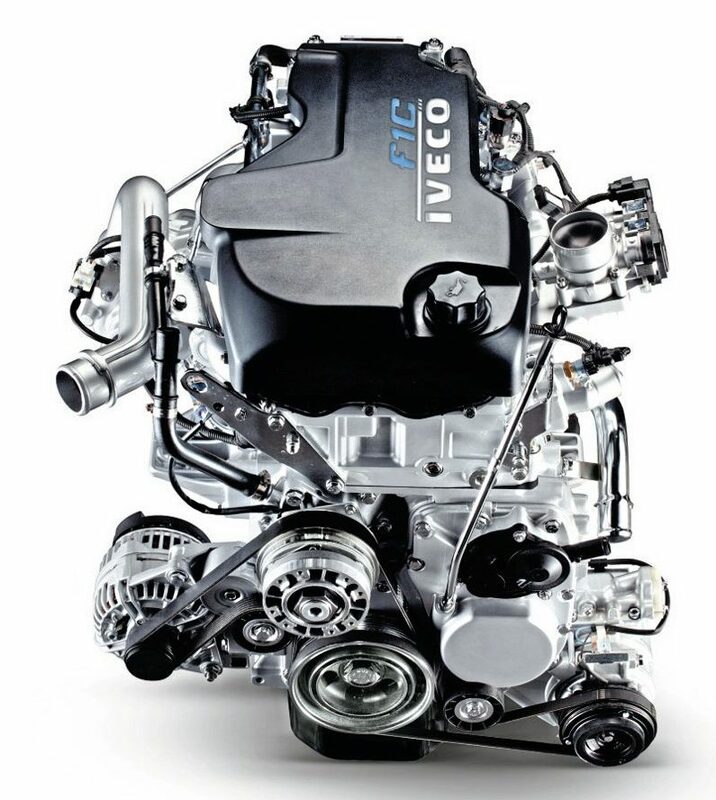 With the new Daily Iveco has stepped up its soft product offering with the aim of increasing uptime. It already had the Daily Business UP App and works with Microsoft to extend the options using the Microsoft Azure cloud. Using it, every vehicle is in real-time contact with Iveco’s control room, located on the Turin Industrial Village site, which we were shown around during our visit. A remote Assistance Service enables remote diagnostics, data setting changes and software upgrades to be carried out remotely. There is also the My Daily portal/App which provides hints on improving driving technique, helps fuel usage monitoring and provides for direct booking of maintenance. 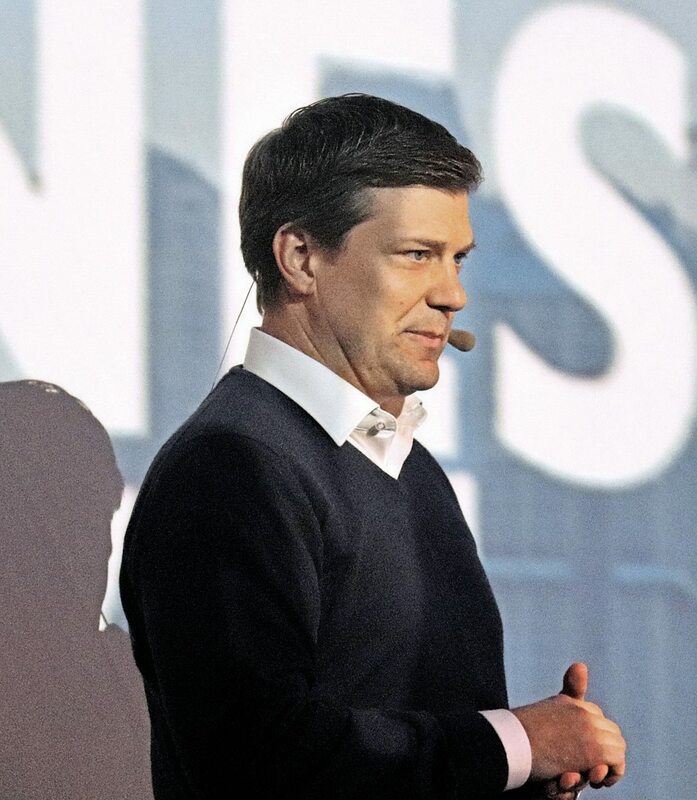 Fleet Management Services, developed in connection with Verizon Connect, include on-screen fleet visibility, advanced diagnostics and real time mileage. With the Web API interface customers can choose to integrate their own existing telematics packages and fleet management systems, they do not have to use the Iveco system. There is much more to come with Daily B-Link. Features being developed include crash reports, safety report, remote door locking, usage based insurance, smart routing and predictive maintenance (including the battery). 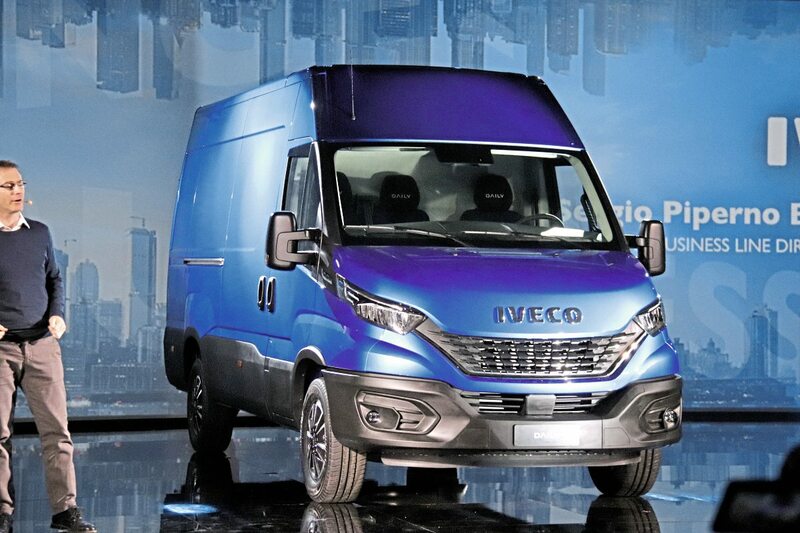 Iveco’s launch slogan suggested that the Daily would ‘Change your Business Perspective’. 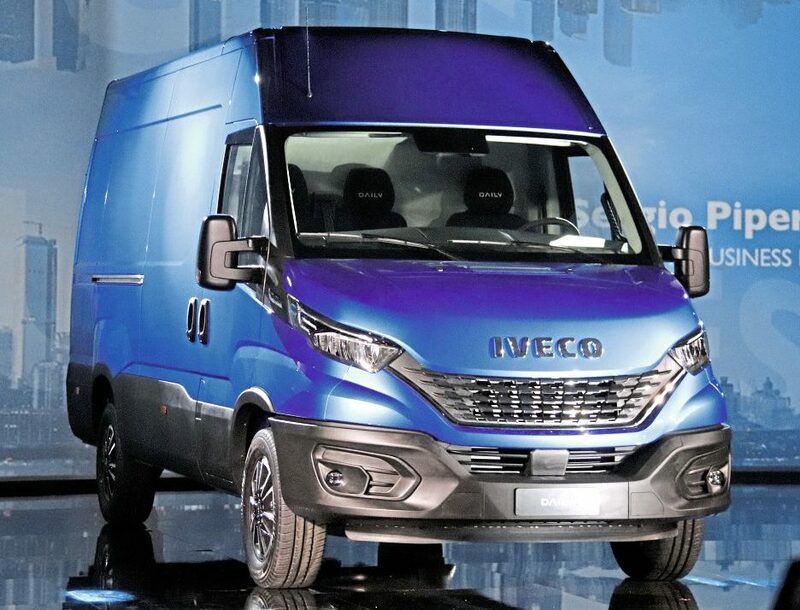 Though it does feature a lot of enhancements over previous models, I think it is more a case of business perspectives changing and Iveco adapting to meet the new requirements, than it leading the way. Nevertheless, prompted by the fact that Daily offers more payload in its sector than competitors and goes some of the way to filling the gap left by the demise of the Vario, increasing numbers of operators are turning to the model for their minibus needs, whether factory built, chassis cowl or van conversion, and most of the reports I hear are positive about the experience. In this respect, the business perspective for the Daily is changing.